Friends of Eugene, land use, transportation, and environmental non-profit. West Eugene Collaborative, regional non-profit land use planning project. Southeast Neighbors, neighborhood association representing 13,000 people and 2700 acres of mapped upland wildlife habitat. University of California, Berkeley. Master of Architecture professional degree, 1988. Outstanding Graduate Student Instructor award. Columbia University, New York, New York. graduate studies in architecture, 1984. University of California, Santa Cruz - Bachelor of Arts, "Environmental Studies: Ecodevelopment and Appropriate Technology," minor in Engineering, 1983. political science, ecology. Museum of Fine Arts, Boston, Massachusetts, 1976-1977. art history. Decordova Museum Art School, Lincoln, Massachusetts, 1970-1975. sculpture, painting. Massachusetts Audubon Society, Lincoln, Massachusetts, 1968-1975. natural history, environmental education. Christopher Alexander, William Feinstein, Howard Friedman, Donlyn Lyndon, Mary Turnbull, Mark Smith, Laura Hartmann, Claude Stoller, (UC Berkeley); Joseph Esherick (EHDD); Paul Niebanck, Michael Rotkin (UCSC); John Scharr, David and Sharon Schuman (Deep Springs); Ted Tucker (Decordova Museum). Lars Uwe Bleher (University of Oregon; Atelier Markgraph, Frankfurt, Germany), Mark Dedlow (Lawrence Berkeley Laboratory), Charles Ehrlich (Lawrence Berkeley Laboratory, Pacific Gas and Electric), Peter Horne (Yost Grube Hall, Portland, Oregon), Jun Inoue (Autodesk, 3D Innovations, Tokyo), Janine King (University of Florida), Ross Leventhal (NBBJ, Seattle), Lawrence Martin (Roybal Corporation, Denver), Douglas Noble (University of Southern California), David Owen (Senior Editor, ArchitectureWeek, Portland, Oregon), Alene Stickles (Zimmer Gunsul Frasca, Portland), Michael Wheeler (Artifice, Inc., Eugene, Oregon), Stefan Wynn, Misako Yamaguchi (Roybal Corporation, Denver). "Interview with Robert Ivy," ArchitectureWeek No. 560, 2012.0516. "The Project is Going Down ," ArchitectureWeek No. 553, 2012.0307. "Inner Light of the National Cathedral," ArchitectureWeek No. 564, 2012.0704. "Reflections on 'Digitally Enabled Social Change — Activism in the Internet Age'," The Center for the Study of Social Movements at the University of Notre Dame, 2011.1211. "Postcard from West Potomac Park," ArchitectureWeek No. 537, 2011.1026. "Crane Collapse Shifts Memorial Events," ArchitectureWeek No. 531, 2010.0907. "Engineering Ground Zero on PBS," ArchitectureWeek No. 531, 2011.0907. "Chipperfield's Anchorage Museum," ArchitectureWeek No. 524, 2011.0720. "Comparing Fukushima and Chernobyl," ArchitectureWeek No. 514, 2011.0413. "Chernobyl by the Sea," ArchitectureWeek No. 511, 2011.0323. "Beyond Three Mile Island," ArchitectureWeek No. 510, 2011.0316. "Earthquake and Tsunami in Japan ," ArchitectureWeek No. 510, 2011.0316. "Postcard from Berlin," ArchitectureWeek No. 503, 2011.0112. "Green Science in Salt Lake City," ArchitectureWeek No. 492, 2010.0929. "On 'Travel and the Built Environment'," ArchitectureWeek No. 487, 2010.0818. "Postcard from Frankfurt," ArchitectureWeek No. 472, 2010.0428. "Royal Gold Medal for I.M. Pei," cover story with David Owen, ArchitectureWeek No. 462, 2010.0210. "Haiti Earthquake  an architectural perspective," cover story, ArchitectureWeek No. 458, 2010.0113. "White Paper on Infill and Climate Change," for Friends of Eugene, 2009.1104. "West Eugene Proposal: a step in ending the conflict," guest editorial with Chris Pryor, Eugene Register Guard, 2009.0405. "Climate Action Now," cover story, ArchitectureWeek No. 378, 2008.0430. "Tackling Climate Change," cover story, ArchitectureWeek No. 377, 2008.0423. "Jean Nouvel Pritzker Prize," cover story, ArchitectureWeek No. 374, 2008.0402. "Les Archives Départementales," cover story, ArchitectureWeek No. 372, 2008.0319. "Milwaukee's Urban Ecology Center," cover story, cover photo, ArchitectureWeek No. 359, 2007.1128. "Wiki Liberation," ArchitectureWeek No. 354, 2007.1017. "Aldo Leopold Legacy Center," cover story, cover photo, ArchitectureWeek No. 352, 2007.1017. "Public Architecture of Curitiba," cover story, cover photo, ArchitectureWeek No. 351, 2007.0926. "Extraordinary Interpreter," cover story, cover photo, ArchitectureWeek No. 341, 2007.0711. "Dominus in Depth," cover story, cover photo, ArchitectureWeek No. 339, 2007.0926. "Mayne Courthouse," cover story, cover photo, ArchitectureWeek No. 316, 2007.0926. "Five Years Later," cover story, ArchitectureWeek No. 303, 2006.0913. "Disaster Engineering," cover story, ArchitectureWeek No. 254, 2005.0831. "Neighborly Mod," cover story, ArchitectureWeek No. 226, 2005.0202. "Postcard from Thomasville," ArchitectureWeek No. 194, 2004.0421. "Postcard from Rome," ArchitectureWeek No. 184, 2004.0303. "Citizens State of the City 2003," guest editorial with Kitty Piercy, Eugene Register Guard, 2003.0120. "Postcard from London," ArchitectureWeek No. 75, 2001.1114. "World Trade Center Destroyed," cover story, joint editorial with B.J. Novitski, ArchitectureWeek No. 66, 2001.0912. Architectural Design in Live 3D, invited conference seminar at A/E/C/ Systems 2000, Washington D.C.
Southeast Neighbors, lead article for each newsletter, 2000 through 2009. PetitionOnline.com, free speech web site for grassroots democracy, with Mike Wheeler, Artifice, Inc. from 1999 to current. "Perspectives on Radiance," invited guest commentary, Nikkei Computer Graphics magazine, Tokyo, May 1999. RenderCity!, with Mike Wheeler, Artifice, Inc., web-based user interface and automated remote rendering service using the Radiance lighting simulation rendering engine. DesignWorkshop Machines, with Mike Wheeler, Artifice, Inc., web-based modeling accessories for DesignWorkshop. "Conceptual Design Energy Analysis Tool," PEIR II grant participant with Geopraxis, California Energy Commission, 1999-2001. Great Buildings Online, architectural reference web site, with technical lead Mike Wheeler, Artifice, Inc.
MicroSHADOWS for Power Macintosh, user-interface design for 3D solar impact and building code analysis software, for Artifice, Inc. with EPCOT of Tokyo, Japan, 1996-1999. MachTen Radiance, a simple port of Radiance by Greg Ward, Lawrence Berkeley Laboratory, for the MachTen operating system, a Power Macintosh native Unix implementation from Tenon Intersystems that runs transparently on top of Macintosh System 7.5. New Media Center, University of Oregon, principal investigator for founding proposal, with Zary Segal and Dan Udovic, 1994-1995. "DesignWorkshop," architectural 3D modeling software, published by Artifice, Inc., 1993 - 1999. "Computer-Integrated Introductory Design Studios," lead author of joint paper (presented by co-author Linda Zimmer), ACSA/EAAE International Conference, Prague, 1993. 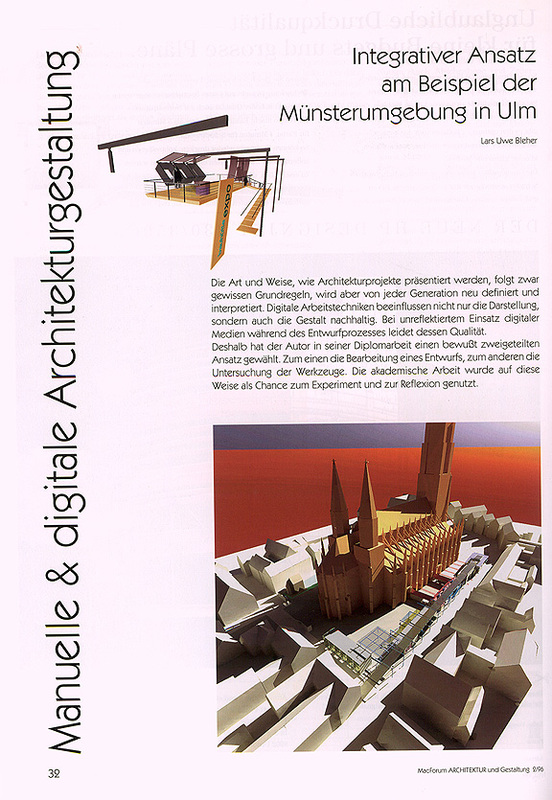 "DesignWorkshop - Architectural Design Modeling," paper presented, ICSRIC '92, Baden-Baden, Germany. "The Great Buildings Collection," paper presented, ICSRIC '92, Baden-Baden, Germany. "Computer-Integrated Studios at Oregon," paper presented, ACSA West '92, San Luis Obispo. New Faculty Award, summer salary support for development of a multimedia encyclopedia of architecture, University of Oregon, November 15, 1991. Academic Software Development Proposal, continuing equipment support for the development of a multimedia encyclopedia of architecture, valued at $12,063, from Apple Computer, May 20, 1991. "Achieving Integration by Student Ownership of Computers," primary instructional equipment grant for the Design Computing Laboratory, a 24-hour student access computer lab, providing 10 Macintosh IIcx and IIx computers valued at $83,000, based on a five year plan for integrating digital media in the department, from Apple Computer, 27 November 1990. 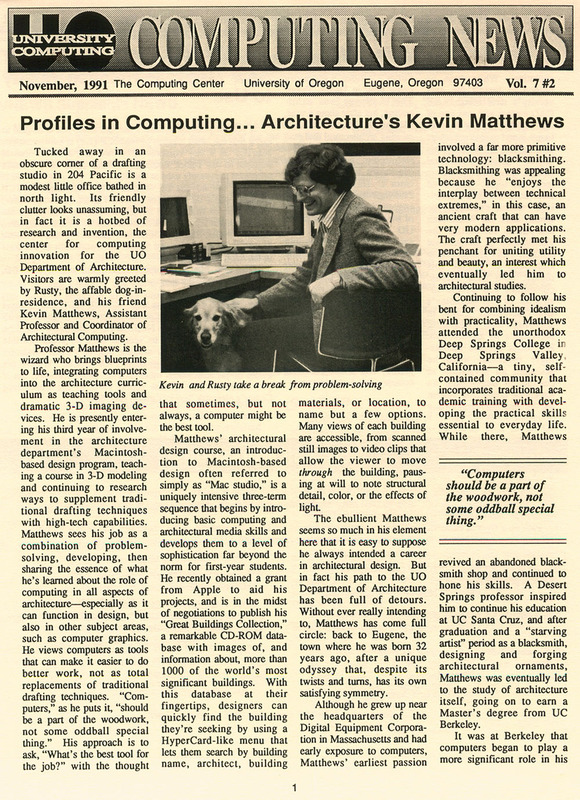 "Linking Design, Cost Estimation, 3-D," review article on architectural software for the Macintosh, MacWEEK magazine, 7/10/90. "Models of Maturity," review article on 3D modeling software for the Macintosh, MacWEEK Magazine, 3/27/90. Great Buildings Collection Equipment Grant, intial supporting grant for a multimedia encyclopedia of architecture, valued at $15,005, from Apple Computer, 6/22/90. "An Integrated Computer-Aided Design System for the Superconducting Super Collider," presentation, U.S. Department of Energy Workshop on Computer-Aided Engineering, 1989. "In Search of CAD Format Standards," guest editorial, MacWEEK, August 1989.
" Three-Dimensional Sketching," master's project in architecture, UC Berkeley, 1988. "Steps Toward a Philosophy of Design," thesis in environmental design, UCSC, 1985. Transatlantic Climate Bridge, Travel Fellowship in Germany, through the Ecologic Institute, with visits to Frankfurt, Darmstadt, and Berlin, April 2010. Eugene-Springfield Chambers of Commerce Leadership Training, Invited Panelist and Trainer for land use planning segments, 2008, 2009, February, 2010. Design Juror, EPSE Awards in Brussels, Belgium, December, 2009. "Sunday at Noon: West Eugene Collaborative," (mp3). Public Radio Talk Show Guest representing the West Eugene Collaborative, May, 2009. Keynote Speaker, Association of Architecture School Librarians (AASL) National Conference, March, 2009. Santa Barbara Forum on Digital Transitions, Invited Panelist, Coordinating People Online, 2006. City Club of Eugene, land use series, Presenter for Friends of Eugene, 2006. Brazilian Marble and Granite, Travel Fellowship in Curitiba, Brazil, May 2005. Citizens State of the City, Eugene, Oregon, Presenter for Friends of Eugene, 2005. Design Juror, Chrysalis national remodeling awards, 2004 (announced June 11, 2004 in Atlanta, during the Southern Building Show). Design Juror, Auto-des-sys 2000-2001 form-Z Joint Study Awards, 2001. Seattle AIA 'Meet the Press' event, Invited Panelist, 2000. Design Juror, Seattle AIA Awards, 2000. Competition Juror, "The Designers 3D CAD Shootout for Architectural CADD Systems," at A/E/C Systems 2000, Washington D.C. Convention Center, June 2000. Competition Juror, "The Designers 3D CAD Shootout for Architectural CADD Systems," at A/E/C Systems '99, Los Angeles Convention Center, May 1999. "3D Modeling in the Design Studio," Faculty/Student Workshop with Fred Brooks, Stuart Feldman, and Phil Christiansen, College of Architecture and Urban Planning, University of North Carolina, Charlotte, 1998. "Computer-Integrated Architectural Design Curriculum," Faculty Workshop, College of Architecture and Urban Planning, University of North Carolina, Charlotte, 1997. "Practical Design of 3D User Interfaces," Course Instructor, ACM/SIGGRAPH 1996, New Orleans, August 1996. "DesignWorkshop with QuickDraw 3D and the Total Building Delivery System," seminar series in Nagoya, Japan, sponsored by Morisada-Kosho Corporation, Fuji-Xerox, Prova, and 3D Innovations, March 1996. 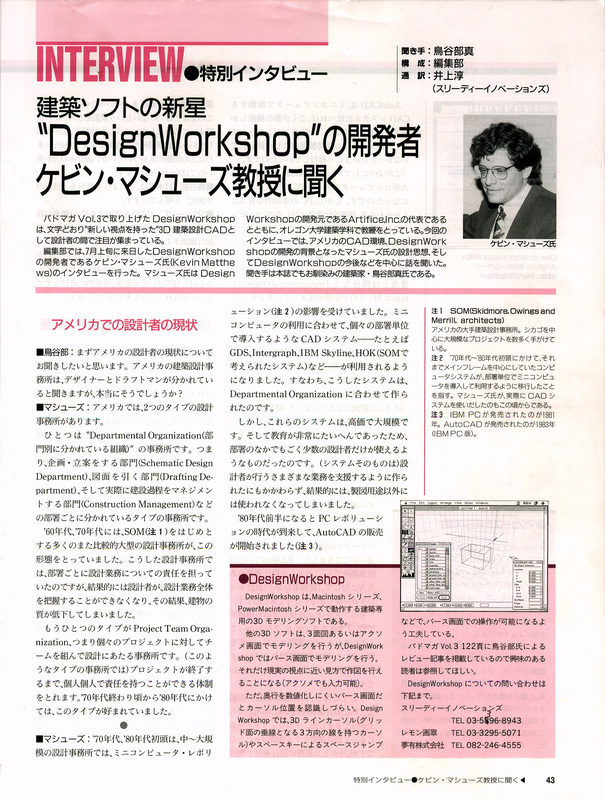 "DesignWorkshop and the Total Building Design System," seminar series in Japan, Tokyo, Osaka, Nagoya, Hiroshima, Kanazawa, sponsored by Apple Centers Japan, Yume Ga Aru, Prova, and 3D Innovations, July 1995. "Practical Design of 3D User Interfaces," Course Instructor, ACM/SIGGRAPH 1995, Los Angeles, August 1995. "DesignWorkshop" presentation, Berkeley Macintosh User's Group, Berkeley, California, June 30, 1995. "Architectural Multimedia," Architecture and Allied Arts Alumni Association lecture series, Eugene, Oregon, 1994. "CAD on the Mac," public talk, Software Association of Oregon, September 1994. The Designer's Toolkit, professional seminars for Artifice, Inc., summer 1994. "Architectural Multimedia," Architecture and Allied Arts Alumni Association lecture series, San Francisco, 1994. Great Buildings Collection public installation, Portland Architecture Week, Portland, Oregon, 1993. The Designer's Toolkit, professional seminar for Nike, Inc., winter 1993. "AEC Design Technology in the U.S.," private lecture for Itogumi Construction, Portland, Oregon, 1992. "Getting Started with Macintosh CAD," public lecture, Macintosh Business Conference, Los Angeles, 1989. "The Mac at Cal," presentation at Educators' Forum, AEC Systems '89, Los Angeles. Energy News, reporter and managing editor for a monthly alternative energy newspaper, 1982. Glenwood Village Hall and Town Square, national competition entry, with Brewer Design of Portland and the students of Architecture 410/510, May 1996. Retail Sales Cart Prototype, for Activate, Inc., design collaboration with Brewer Design of Portland (Misako Yamaguchi, design associate), Spring 1996. University of Oregon Law School Design Charette, team member, and also provided computer models used by other teams, January 1995. Trade Show Booth, for Artifice, Inc., modular steel with wood and foam-core inserts, designed for light weight and rapid no-tools assembly, 1995.
International Residential College Feasibility Study, professional services proposal, including demonstration of computer-aidied interactive user-group visualization activities, with James McLane, Polly Welch, Jenny Young, January 1994. Faculty Multimedia Laboratory, proposed remodeling at the UO Computing Center, 1992. Evanston Public Library, national competition entry, with Jenny Young, 1991. Office Remodeling, space for 50 scientific and support staff of the SSC Central Design Group, Lawrence Berkeley Laboratory, 1989. Design Studio Security Remodeling, Wurster Hall, UC Berkeley, 1989. Laurent Street Gates, hand-forged steel, Santa Cruz, California, 1985. Ornamental Detailing at Blueberry Hill, forged and fabricated steel and copper, Scotts Valley, California, 1983-84. Kuumbwa Jazz Center, landscape design, Santa Cruz, California, 1983. Corralitos Gates, fabricated steel and copper, 24'x 6.5', Corralitos, California, 1980-82. Solar Hot Water System for Deep Springs Dairy, collective design and construction of a scratch-built active solar heating system, Deep Springs College, 1979. Meetinghouse, a timber-frame small-group retreat building, Deep Springs College, 1978-79. Remodeling Projects, Deep Springs College, 1978. "Advocating Eugene," personal profile by Ed Russo (1198 words), Eugene Register-Guard, Oct 23, 2006. City of Eugene "We-gene Award" for community leadership, from Southeast Neighbors, April 2010. "Today's Research, Tomorrow's Software" by B.J. Novitski, Architectural Record, December, 1999, p223, quoted at length, also references to DesignWorkshop and the Great Buildings Collection. "Building Respect : World Wide Web sites offer instruction on architecture as art," by J.D. Biersdorfer, full-page feature article on the Great Buildings Collection and the Great Buildings Online, New York Daily News, February 28, 1999, Sunday Business p3. Times of London, feature article on Great Buildings Online, January 6, 1999.
Who's Who in Finance and Industry, biography subject, 1998-1999. New York Times, feature article on Great Buildings Online, December 17, 1998. "Architects are seeing in 3D," photograph, discussion, and sidebar in an article focusing on QuickDraw 3D and architecture, with quoted comments from David Bailey, California architect and DesignWorkshop user, MacWEEK magazine. p37-38, 8/26/96. "Software from the Schools," Architecture magazine, article profiling DesignWorkshop and three other examples of innovative architectural software orginating from university research, by Nancy Solomon. p153-157, 8/96. Who's Who in America, biography subject, 51st Edition. Citation of DesignWorkshop in "3D Sketching" a technical paper in the SIGGRAPH '96 Proceedings, 8/96. Design Thesis by Lars Bleher, University of Stuttgart, using DesignWorkshop and Radiance, described in a feature article in MacForum ARCHITEKTUR und Gestaltung, (Swiss magazine) #2/96, May 1996.
Who's Who in American Education, biography subject, p542, 1996-1997, 5th Edition. 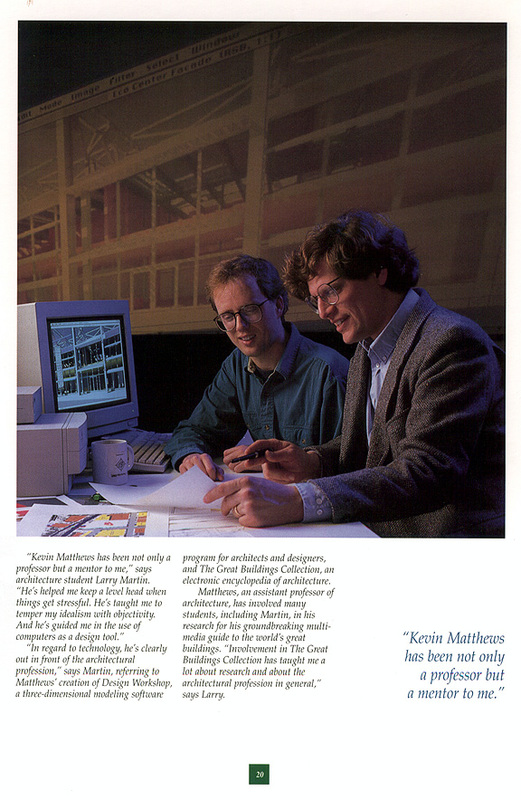 Interview with Kevin Matthews, Personal-Computer for All Designers (PAD ) magazine, Japan, Fall 1995. DesignWorkshop-in-practice series of monthly articles, focusing on work by ARX, an architecture firm in Tokyo, Nikkei Mac magazine, Japan, 10/95, 11/95. National Geographic magazine, photograph showing a virtual reality system for handicapped rehabilitation being used with an environment modeled in DesignWorkshop, 1995. Citation and illustrations of The Great Buildings Collection, in a technical paper on architectural multimedia, by , ACADIA '95 Proceedings, 10/95. DesignWorkshop review and tutorial article, Personal-computer for All Designers magazine, Japan, Summer 1995. Citation of DesignWorkshop in "The Radiance Rendering System," a technical paper by Greg Ward, in the SIGGRAPH '94 Proceedings. "Around the World in 80MB," review of The Great Buildings Collection, The Village Voice, 3-22-94. Mac User magazine "1993 Eddy Finalist Award" given to DesignWorkshop 1.0, in the category of Best New Computer-aided Visualization. "Computers go to School" including profile of design computing at the University of Oregon, Architecture magazine, 9/93. 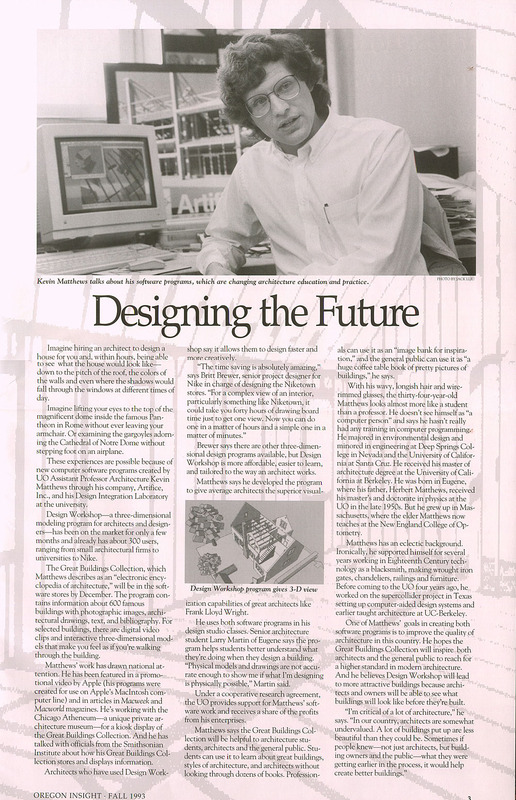 "Designing the Future," Oregon Insight, Fall 1993. 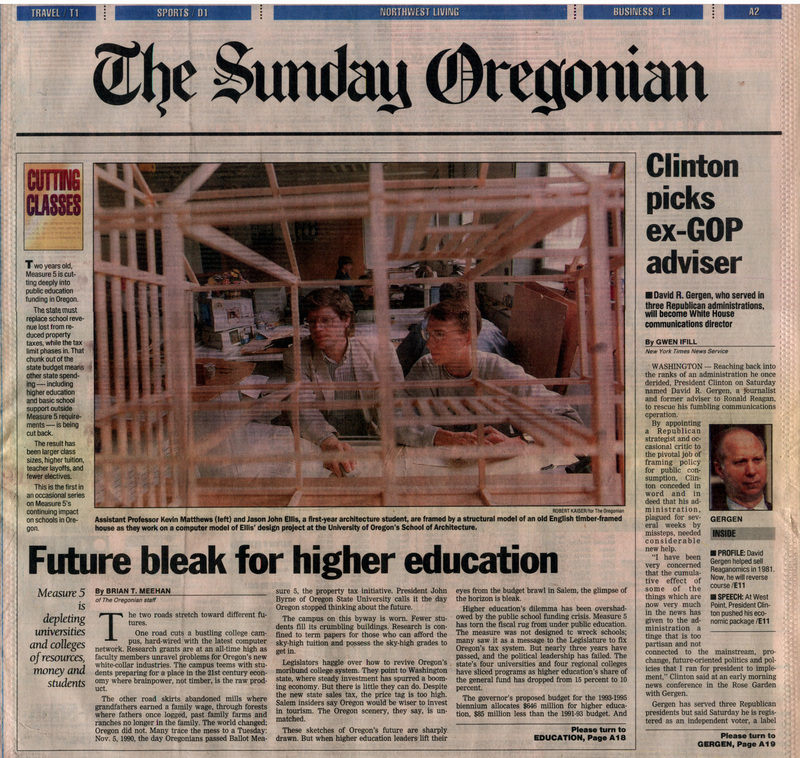 Higher Education in Oregon, featured faculty member, Sunday Oregonian, 5/30/93. Review of DesignWorkshop, Architectural Record . The Great Buildings Collection, general information article, The New York Times, metropolitan edition. "Keying in a Fresh Design," technology transfer success story, Oregon Business, 6/93. 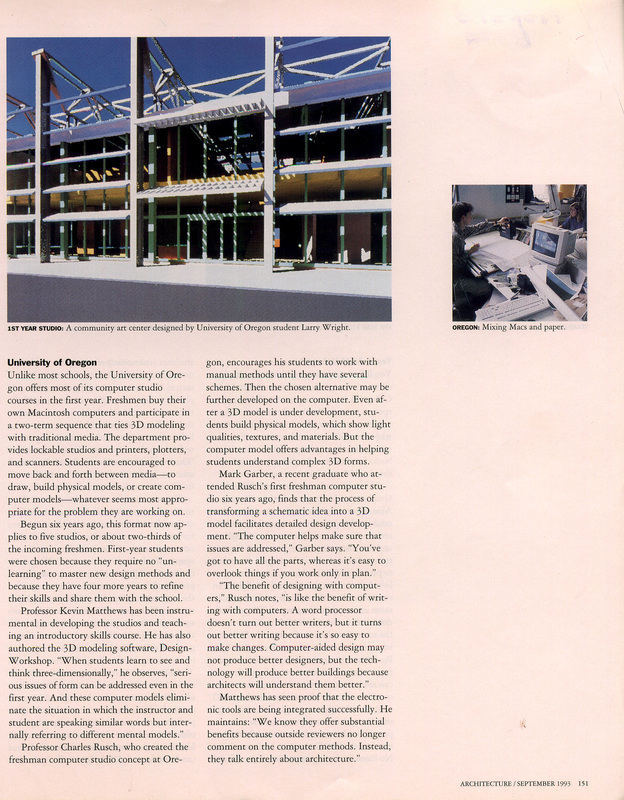 "Mac CAD Software adding Dimension to Architecture," featuring DesignWorkshop, MacWEEK magazine, 1/25/93. "Visiting Lost Cities," including a discussion of The Great Buildings Collection, Computer Graphics World, 1/93. Reviews of "DesignWorkshop," MacWEEK, MacWorld, MacUser, MacUser UK etc. "DesignWorkshop" announcements, PC WEEK, MacWEEK, InfoWorld, Byte, Computer Graphics World, etc. "The Great Buildings Collection," announcement, Syllabus, 12/91. "Profiles in Computing," University of Oregon Computing News, 11/91. "Joining the Group to Save the Individual," Wayland-Weston Town Crier, May 1977. This document is provided for on-line viewing only, except as printed by Author. © 1996-2010 Kevin Matthews, All Rights Reserved.